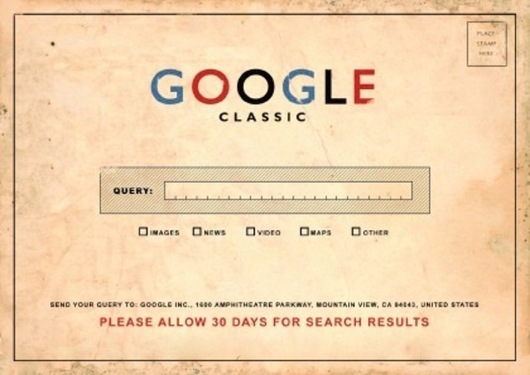 Something that reminds me of my friend Dale's favorite Google jokes -- Google Classic. This web site is, however, not a joke. It actually allows you to compose a full letter, address the envelope, and have it stamped and mailed to the destination of your choice, all for only $1. Sure it costs more than postage, but when you consider the effort involved in obtaining an envelope, a pen, and a piece of stationary (not to mention the fact that I have to actually type the letter in Word first because I can't survive without spell check), it seems like a pretty sweet deal. I've always had a thought that, in our world of instant and global communication, we are missing out on something special about sending a handwritten letters to people. Letters require time and effort, and because the communication is not instantaneous I feel like the format lends itself to a more refined type of writing (someone must spend more time and consideration about making a clear point when there is no means for instantaneous feedback or clarification). I've always been happily surprised to recieve a real letter or card from a friend, especially when most of the communication we get consists of a 'poke' or 'like' on Facebook. This site may be the perfect bridge between these two worlds -- fast and easy composition but still retaining some of that real-world feel of an actual envelope and piece of paper.